DBAL-I2 made in the USA by Laser Devices, a division of STEINER Optics. Brand new, complete with pressure pad switch and quick release mount. Runs on 1 CR123 battery, Brand new with 3 year warranty. Black housing standard but Desert tan can be special ordered- call for info. Manufacturer lead time on this item is typically 1-3 weeks and can occasionally run longer- MOVE QUICK when they are in stock and ready to ship. 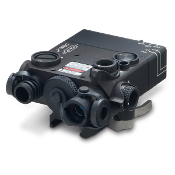 This DBAL model offers two different lasers- one is an INFRARED laser visible only through night vision devices, this is what you use for aiming with your night vision device. The second laser is a visible laser, in this listing a green colored visible laser. This is what you could use for sighting during daytime. THEY DO NOT OPERATE AT THE SAME TIME! In other words, if you have the switch set to IR laser, you will NOT also see the visible green laser. This is a common question from people not familiar with these devices. Everyone wants to weapons mount the PVS14 on a rifle. While there can be some advantages to that, there are some serious disadvantages. 1. Whenever an NV is weapons mounted, the weapon has to be brought up to the shoulder to get a "look" around with the night vision. It's cool in the movies where the Seals are patrolling and everyone has their rifle shouldered.... But in the real world few people have the arm strength to go around like that for a long period of time. 3. God designed you to "look" around by moving your head, not your whole body. With the Night vision head or helmet mounted you can have a more natural and normal "look" around by turning your head, keep the rifle in a safe direction thereby not "sweeping" your team. Then when a target it spotted, the rifle can be brought up, the touch pad on the laser touched and the shot fired. 4. Shooting from a less than perfect shoulder pocket position is easier when the NV is mounted on the head or helmet mounted and the laser used. Quicker for close- in work. Also, when working with a team wherein most or all are using NV, you can develop "codes" using the IR laser to mark targets, mark areas to investigate or move to, even short morse code type messages can be exchanged with the IR laser and nothing is visible to the naked eye. Export: The Export of this product without proper licensing is strictly prohibited and falls under ITAR per title 22, CFR, parts 120-130. $25. ship and insurance. Allow 1-2 weeks from the factory. No Paypal on this item due to factory lead time, your CC will NOT be charged until your order is ready to ship. 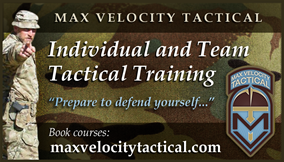 And watch a review by SouthernPrepper1 of Doomsday Preppers fame!